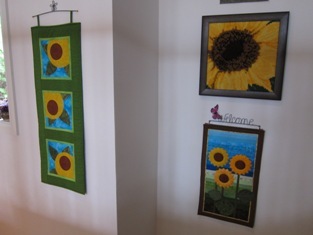 Em's Craftwork and Quilting at Mount Colah: I did keep myself busy!! I haven't been that very busy with my work but a few 'major events' have kept me occupied, enough to prevent me from spending time to update my blog.!! Nonetheless, I have managed to finish a few small projects. They keep me grounded and contented. Those events have now passed, and I hope to be able to regularly write more about my handwork to share with everyone who is interested. Here are some photos and brief descriptions of the finished projects. These are the latest items that I have made. 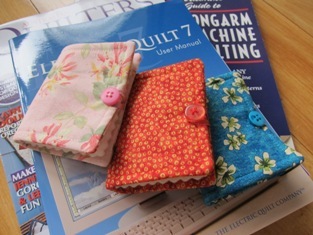 They are needle cases for my dear friends. Those ones I previously sent to them got lost in the mail, sadly. 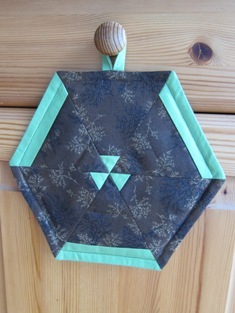 This is a teapot stand I have made for my son's 'Aunties Carlette and Colly' after we visited them at their new home. 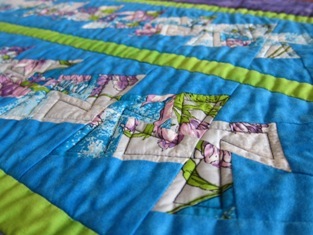 The pieces sewn were from when I was trying out the cutting technique that I read in a quilting magazine. St Patrick rose is my favourite. The colour is, of course, yellow. I have got the actual plant in a pot at the front of my house. Fourteen of the roses (from a local florist) greeted me at the front door last week. My dear husband did remember our anniversary. 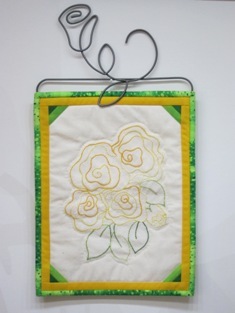 :-) I have got the embroidery pattern, designed by Jennifer Reynolds, from a Handmade magazine borrowed from Hornsby Shire Council library. I changed the colours to my favourite shades of yellow and modified how it's finished. I thought to myself that I have to make these Hawaiian leaf cushion covers, designed by Lisa Cox of A Spoonful of Sugar, when I saw the pattern in a Handmade magazine that I borrowed from the local library. It looks different and exotic to me (Mind you, my husband thought it was an alien hand !!). Again, I didn't follow all the instructions.!! I changed the colours to my favourite blue and modified the finish. Noelene, one of the lovely ladies in my local sewing group, has given the patterned fabric to me after I told her that I really like its purple flowers with the green leaves and blue background. 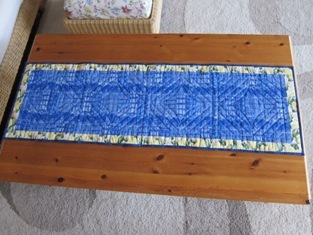 I cut it up to make a double Irish chain quilt (not yet finished) and used the scraps to make this table runner while trying out the Wiggly wheels pattern (again). My neighbour, Ruth, once remarked to me 'Em, you 'seem' to like Sunflower'. I asked her (with a smile) 'how could you guess?'. 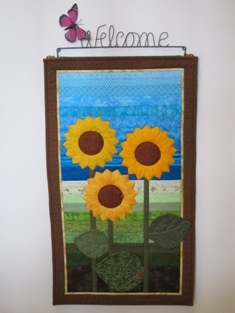 This is the back of the table runner. I have decided to keep the Dutch theme and used up all the Dutch Houses fabric, designed by my (another) Dutch friend, Linda Robertus, that I have got left and the Tulip fat quarter given to me by Marijke. We have got only one coffee table in the house. 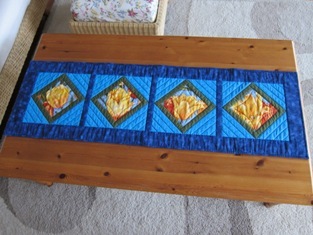 But here is another table runner made from scraps I recently bought from Craft Depot. 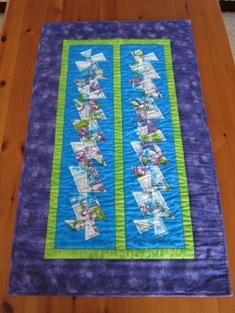 If I appear to be 'mad' about making table runners...I like to try out techniques that I have read in craft magazines and quilting books. 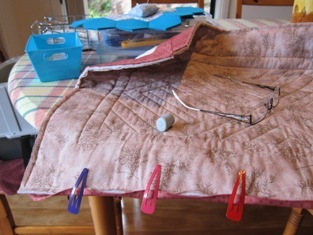 Working on a small project like table runner to try out the techniques is achievable within a reasonable timeframe (together with everything else I do). Also, it does keep me happy with using my two hands to do something I love and enjoy (very much). Wow - you have been very productive Em - so many lovely projects completed. 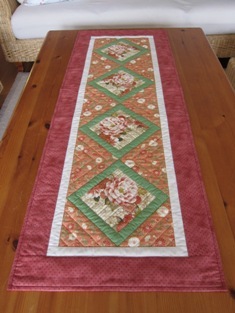 The Tulip table runner is gorgeous - what a great way to use holiday fabric! 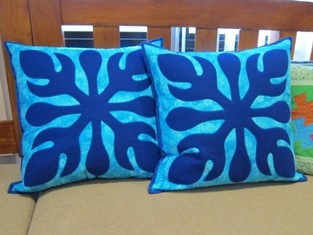 Love your Hawaiian Cushions - very striking in the blue colourway. Thanks very much to your pattern of the cushion, Lisa. Also, I think your email address is fun. I love Mary Poppins and her way of 'connecting people'. 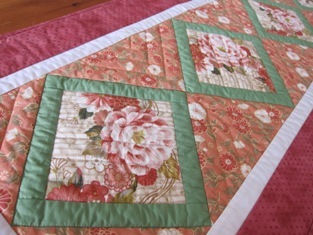 :-)...It would be nice to have more time in a day to spend on my handwork (to get the bigger projects finished sooner). But at the same time, I love my job. So, I'm keeping the balance between the two. I'm pleased to hear that you think I have been productive - means I'm doing OK. :-) Cheers.